Egypt is 15th most crowded country in the world. In whole country live almost 85 milion people. Most of its territory of 1,010,000 square kilometers (390,000 sq mi) lies within North Africa and is bordered by the Mediterranean Sea to the north, the Gaza Strip and Israel to the northeast, the Red Sea to the east, Sudan to the south and Libya to the west. 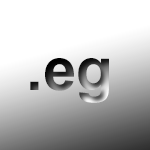 Egypt domain registration is much more restricted. First of all You don’t buy domain name, You rent it. You can’t use the website for any untraditional or unethical content. It means that In Egypt it is impossible to have adult content websites. You also can’t make a website to offend anyone or anything. It is also unable to trade or sell domains, If You will try to sell domain name, You will lose it. Local presence is required in Egypt.